Dylan telling Sky there's no way back. Elle (correctly) guessing that Cam could have been Rob. Sky telling Lou and Mishka she's not sure who the father to her child is. Paul looks lost as he sits at Rob's bedside holding his hand. The door opens and Paul turns around to find Gail standing behind him. They look intensely at each other and no words are spoken. Sky and Mishka are sitting at the kitchen table and Lou is standing behind them. Miskha tells Sky that she must have some idea who the baby's father is. Sky says of course she does, it's either Dylans or JP's. However before saying JP's name she pauses, obviously thinking of her night with Stingray. Mishka tells Lou to heat up some Russian sounding dish from the fridge. She says it will help Sky recover from her shock! Sky thinks the pregnancy is her punishment for losing control of her life. Mishka says it takes two to polka and tells Sky ‘??? ?????? ?, ?????? ', which in English means ‘What's done is done'. I knew my Russian GCSE would come in handy one day. Mishka tells Sky she has to accept things and decide what to do next. However she points out that what Sky feels today she may not feel tomorrow and therefore she should take her time. Sky says she feels miserable, scared and alone. Mishka understands the miserable and scared part but alone? Nope. She takes Sky's hand and tells her if she needs big crying or big talking she is there for her. GAIL: A year ago I had three healthy kids, now Elle's on the verge of a nervous breakdown, Cam's criminally insane, and Rob's in some kind of self induced coma, yes, I hold you directly responsible. Gail sits back down beside Rob and tells Paul she will never forgive him. Janae brings in some washing and finds Boyd asleep on the couch. She hurries him up and tells him he should be up already as his exam starts soon. Boyd says Toadie promised to wake him and Jane points out that Toadie has done nothing but glue a pen to his fingers and a stethoscope to his ears! Janae shouts into the stethoscope telling Boyd he's an idiot and then shouts for Toadie. Boyd tries to go back to sleep but Janae forces him up and pushes him out of the living room and towards some clothes! Paul is sitting in the corridor when Gail approaches him with a peace offering in the form of hospital coffee. Paul isn't sure he deserves it and Gail says if it's as bad as the stuff she had on the plane then he probably does deserve it. Awww the days when Paul and Gail were airline stewards together. They taste the coffee and I get the feeling that's it worse than any coffee ever served up on an aeroplane. Paul says he knows all about hospital coffee and Gail says she had forgotten that he was laid up here for a while. Paul signals to his fake leg and tells Gail it was probably the best thing that happened to him as it made him reassess his life. Gail apologises for what she said before but Paul tells her it's ok, he can see why she'd want to blame him. She tells him it was just the shock of seeing her baby lying there so helplessly. Paul tells Gail to remember he has a stake in this too and despite what she may think he has always cared. Gail says she doesn't know how it could have all gone so wrong. Elle and Izzy arrive and Gail rushes towards her daughter. They hug and Elle tells Gail how much she has missed her. Still hugging Gail, Elle pulls Paul in for a family embrace as Izzy looks on. Lou isn't sure he and Mishka are the right people to be dealing with Sky's situation. Mishka asks him who else is there, Harold? She reminds Lou that Harold is away and that Sky has told them she does not want Harold to know. Lou thinks deep down Sky wants her Grandfather. Mishka thinks that Lou is selling himself ‘tiny' and that he thinks Harold is better equipped to deal with matters of the heart. Mishka tells Lou he is the most understanding man she has ever met and says he is the closest thing right now that Sky has to a father. Mishka says they are not going to abandon Sky. Sky sits on the pavement and watches as Janae drags Dylan out of No 26. She wants him to take Boyd to Uni in his car and explains that if he doesn't then Boyd will miss his exam. Boyd still has the stethoscope stuck to his ears and the pen stuck to his fingers. Dylan finds this very amusing and tells Boyd he will never live this down. As Dylan goes to get in his car he spots Sky. She stands up and walks towards him but after looking at her for a while he looks away and starts talking to Boyd and Janae. Sky looks on disappointed. Gail and Elle are at Rob's bedside and Elle says none of this makes any sense. If it was Cam who done all of this then she never really knew him and how can that be possible? Gail agrees and notes how close Elle and Cam were. Elle says she was closer to Cam then she was to Rob; Rob's always been a closed book, plotting behind people's backs. Elle says she knows it sounds bizarre but she has a feeling that Cam is innocent. Gail sympathises but says all the evidence points to Cam. Elle says someone could have been pretending to be Cam and asks who else could get away with that other than his identical brother. Gail says the boy lying in the bed is not Cameron – she knows this because she is his mother. Elle says when the boys were young Gail would have to dress them differently so she could tell them apart. Gail says from a distance she couldn't tell the boys apart but up close it was easy as Rob has a mole on his right arm. Gail lifts Rob's sleeve to reveal the mole. Elle starts crying and says she doesn't believe Cam would want her dead. Paul and Izzy arrive and Izzy sees Elle is upset and jumps to comfort her, but Elle leans towards Gail who hugs her and tells her everything will be all right. Paul tells Gail he has heard from the police station and has been told that they can see Cam for a few minutes. Gail tells Elle to go ahead and says she will join them later. Paul, Izzy and Elle leave and Gail leans down to speak to Rob. GAIL: Sweetheart I know life hasn't been easy for you but don't give up on it now eh? Others just misunderstood that's all, but you've always been very special to me. Gail kisses Rob on the head and as she leaves the room a tear streams down his cheek. Sky and Mishka are sitting on the couch whilst Lou is in the kitchen. Sky doesn't know how she can deal with Dylan if he won't even talk to her. Mishka suggests Sky write him a letter but Sky says she won't even be able to tell Dylan whether he's the father or not. Lou tells Sky if she can't talk to Dylan now maybe she should contact JP. Sky says she can't as she has messed his life up already. Lou tells her if there is the slightest chance the baby is his then she must talk to him. Sky looks like she about to burst into tears. Janae is clearing up No 30 and is ranting to Dylan about Toadie's silly games. Dylan wants to tease Boyd some more but Janae tells him to leave Boyd alone as he's just sat an exam with a stethoscope glued to his ears. Janae tells Dylan she saw the way he looked at Sky and knows he still has feelings for her. Dylan doesn't get time to answer her claims as Boyd arrives home still sporting his stethoscope! He tells them he got a hard time at Uni but now has industrial material to undo Toadie's prank. Gail, Paul, Elle and Izzy arrive and Cam's screams can be heard as they enter the police station. Elle says she doesn't want to see Cam like this and Gail says that's fine, she can wait here. Gail looks at Paul and suggests maybe she should see Cam alone. Izzy says Cam is Paul's Son too and thinks he should go in the room. Gail tells Izzy this is a family matter and says it's really none of her business. Paul tells Izzy that Gail is right and thinks too many people will overwhelm Cam. He tells Gail he will look after Elle whilst she sees Cam. Gail looks apprehensive as she turns towards the door. Cam seems shocked to see Gail and rushes towards her for a hug. He tells her she has to get him out of here as he is surrounded by people talking to him about things he knows nothing about. Gail tells him he is going to get help. Cam has a look of horror on his face as he realises his Mum doesn't believe he is innocent. He tells her it wasn't him and that Rob is to blame. Gail tells Cam he is making it worse for himself but Cam won't listen and tells Gail he is not that type of person. He says he wouldn't hurt anyone - he's not nuts. Sky is on the phone to JP. When she ends the call she tells Lou and Mishka that JP has been told he can't have kids. In his first year at Uni he was short of cash and so tried to become a sperm donor. However when tests were run it appeared he wasn't quite capable. Lou is cynical but Sky assures him JP would not lie about this. Mishka says this is good news as it proves Dylan is the father. Sky pauses again before bursting into tears. She says she misses Dylan and if they were together things would be so different. Sky thinks Dylan would be thrilled, as they loved each other. Lou tells Sky she has to talk to Dylan and give him a chance to accept some responsibility. Sky agrees and leaves the house. Janae is talking into a webcam about Toadie's bad habits and Ned's bad singing. Then she gets onto the subject of Boyd, but as she is about to talk about his bad habits he arrives. He's got rid of the stethoscope and asks Janae what she's doing. She tells him she's set up a Webblog called myfoulhousemates.com. Before you google it I've checked and it doesn't exist! She tells Boyd she has set up a forum where visitors to her site can share their stories with her. Boyd is worried he is going to be discussed on the internet but Janae assures him it will be ok and what's more it will earn them some cash due to sponsored adverts that will run on the blog. Gail and Cam are sitting opposite each other at a table. Cam tells her he has lost two whole months of his life. The only memory he has is waking up to Rob pinching him. Gail tells Cam it was Rob who was in the car crash and it's Rob who is in hospital. Cam gets upset and tells her Rob was talking to him about hurting Paul and Elle. He asks Gail to believe him but she is ushered out of the room where Paul, Elle and Izzy are still waiting. Paul stands up and moves towards Gail. She tells him Cam shouldn't be here and says the look on his face was that of utter confusion. Gail says that Cam believes he has done nothing wrong and Paul insists he is not well. Gail says either that or Cam really is innocent. Elle looks convinced and Izzy looks like she'd rather be anywhere else. Dylan is doing something complicated under the bonnet of his car. Sky slowly approaches and stands behind the bushes too scared to make herself seen. Sky tells Dylan there is something they need to discuss. She says she knows he hates her. Dylan interrupts and asks if that's the case then why are they talking. Sky tells him this isn't about her; it's about both of them. She asks for two minutes of his time, as she needs to tell him something important. Dylan tells her she has him confused with someone who cares. As he drives off Sky says he will care and shouts that she is pregnant. However he's got his music up loud and no one is around to hear Sky's declaration. Sky arrives home and Lou and Mishka ask for updates. She tells them Dylan wouldn't give her a chance to tell him and so she is taking matters into her own hands. She has booked an appointment for tomorrow – she will be in at 9 and out by lunch. Lou and Mishka thinks she needs more time to decide but Sky won't beg Dylan to listen to her and thinks she has been humiliated enough. Sky is in tears and tells them there are not her parents and this is not their decision to make. She goes to her room leaving Lou looking worried. Paul, Gail, Elle and Izzy arrive at No 22. 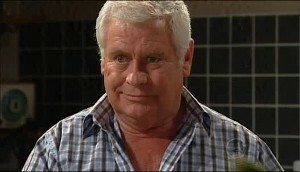 Gail looks at her old house as soon as she walks through the door and Paul asks if Ramsay Street has brought back any memories for her. She says it seems exactly the same and asks Paul if there is anyone still around from her time on the street. Paul tells her Harold is still here and Gail says he didn't deserve to lose his family. Izzy says Harold is not the only one dealing with sad things and comments that misery seems to stalk half of the street. Paul and Gail exchange a look and Gail does some fabulous eye rolling! Izzy doesn't take the hint and says she's not just talking about Cameron she's talking about all kinds of dramas and states that she herself has had hundreds. The party popping people ask how many of those she brought on by herself. Gail's mind is asking who the hell is this woman and Paul asks if anyone wants some coffee. Izzy puts the kettle on and Paul, Gail and Elle sit at the table. Paul asks Gail how long she will be staying for, she says at least until Robert's back on his feet. Elle asks about Cam and Paul says his recovery will take longer and stresses that part of it will be down to the courts. Gail and Elle still don't understand how Cam couldn't do this; he was always happy go lucky and an open book. Gail says all she saw today was a desperate, frightened version of the boy she brought up. Izzy makes her way to the table and says Gail's beautiful boy is a psychotic monster. Paul tells Izzy now is not the time but she goes on to list Cam's crimes. Elle tells Izzy they don't know for sure that Cam planted the bomb in her car but Izzy continues and says they can't deny what Cam is. Paul tells Izzy that's enough and Gail asks Izzy exactly what her point is. Izzy's point is that Gail has failed as a mother and has raised a child who has become a cold-blooded killer. Gail nods silently but looks like she is about to flip at Izzy any second now….